EFFORTS to convince the Scottish Government to deliver on its commitment for ‘fair ferry funding’ were continuing on Thursday morning when Shetland Islands Council leader Steven Coutts met Scottish island minister Paul Wheelhouse in Edinburgh. Speaking after the meeting, Coutts said the minister had not given any new commitments but vowed that the fight to achieve ‘fair ferry funding’ would continue. 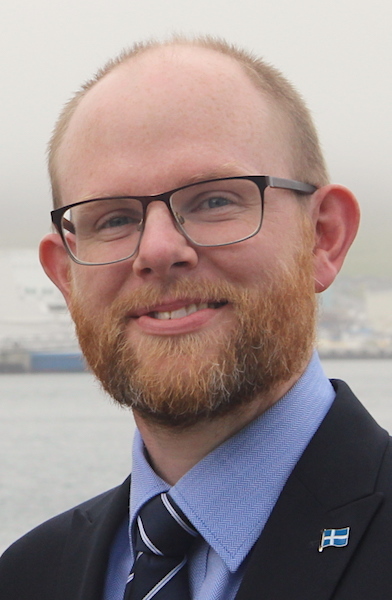 The Scottish Government earmarked £10.5 million for inter island ferry services in Orkney and Shetland for 2019/20, but there is no indication yet as to how the money will be split between the two island authorities. The SIC says it needs £7.9 million in extra funding to maintain the inter islands ferry service in the coming financial year. For 2018/19 the SIC received £5 million and the expectation is that the council would again receive a similar amount from the pot. Orkney Islands Council received £5.5 million for the current financial year. Coutts said his next port of call would be the Scottish Greens whose votes helped the SNP minority government to bring the Scottish budget through parliament. “There is a time pressure in terms of setting the council’s budget for next year, so we are pressing the minister to see the detail of what is proposed. At the moment we don’t know exactly what is coming our way,” he said. Coutts said the minister gave a commitment to advise the council of its ferry allocation before the SIC sets its own budget for 2019/20 on 26 February. A spokesman for government agency Transport Scotland said late on Thursday: ”We understand the pressures that can fall on individual local authorities and remain committed to the principle of fair funding. This year’s draft budget has made available a further £10.5m in support for internal ferry services, bringing the total support provided in the last two years to £21 million. “Shetland Islands Council remains responsible for delivery of Shetland’s internal ferry services, but we recognise the challenges this presents. “Transport Scotland continues to work collaboratively as part of a working group to establish a long term solution in the provision of the internal ferry services and the work of the group remains the optimal route to progress the matter at this point. Meanwhile Highlands and Islands MSP Jamie Halcro Johnston welcomed the backing of a senior SNP minister for action on inter island ferries. According to Halcro Johnston during a visit to Orkney earlier in the week, constitutional relations secretary Mike Russell promised to take back Orcadian concerns about ferry funding to Edinburgh. The Tory MSP welcomed Russel’s acknowledgement that a resolution was required and urged one to be brought forward immediately. It follows complaints from island council leaders that the existing funding settlement, agreed last year, does not meet the full costs of running the internal ferries in Orkney and in Shetland. In the Western Isles, these costs are met by the Scottish Government as part of Clyde and Hebridean ferry service contract. Halcro Johnston said: “I welcome news of Mike Russell’s comments on fair ferry funding, and I’m encouraged by the intervention of a senior SNP minister. As a representative for Argyll and Bute, Mr Russell clearly understands ferry issues rather better than some of his government colleagues. “For many years, the islands have waited and waited for action on fair funding. This year, council leaders have made it clear to the Scottish Government that current funding arrangements are inadequate and do not cover the full costs of running these vital lifeline services. Halcro Johnston said there was still time to make changes ahead of the next financial year and hoped that the call did not fall on deaf ears in Edinburgh.